A traditional Polynesian voyaging canoe has returned to Honolulu in Hawaii, completing the first-ever round-the-world trip by such a vessel. The boat, the Hokule'a, took three years to journey around the globe. Its crew navigated without modern instruments, using only the stars, wind and ocean swells as guides. They aimed to use the same techniques that brought the first Polynesian settlers to Hawaii hundreds of years ago. Hawaii celebrated the Hokule'a's homecoming on Honolulu's Magic Island peninsula. Built in the 1970s, it has travelled around 40,000 nautical miles (74,000km) on this latest trip, known as the Malama Honua voyage, meaning "to care for our Island Earth". Its aim has been to spread a message about ocean conservation, sustainability and protecting indigenous culture. "Hokule'a has sparked a reawakening of Hawaiian culture, language, identity and revitalized voyaging and navigation traditions throughout the Pacific Ocean," said the voyage organisers on their website. Navigator Kala Baybayan Tanaka and Capt. Timi Gilliom consult a nautical chart of Ka‘ie‘iewaho Channel on a sail from Oahu to Kauai to commemorate the launching of Namahoe, Kauai’s first voyaging canoe, in September. Naalehu Anthony, crewmember and chief executive director of Hawaiian media company Oiwi TV which documented the trip, told Hawaii Public Radio that wherever they docked, people greeted them with a Hawaiian "Aloha" greeting. 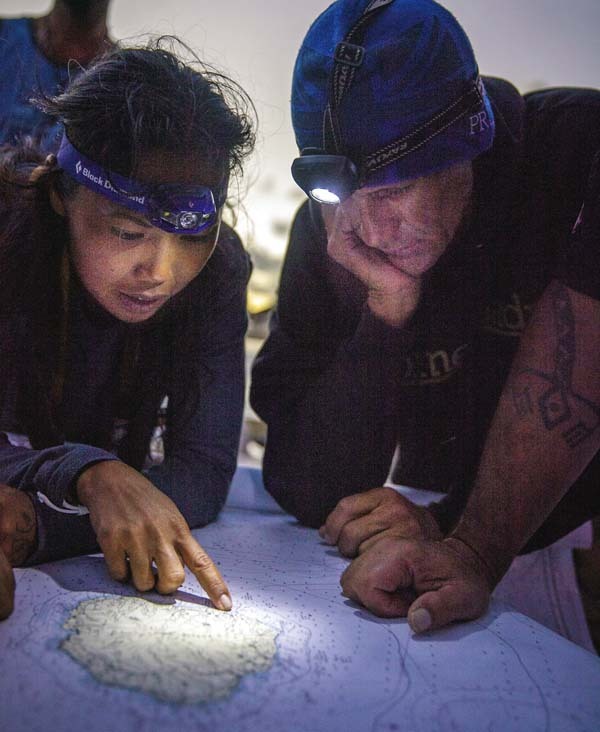 "One of the things I really admire about the voyage, looking back on it, is that we always asked the first nations peoples from these different places for permission to come. We never said we are coming. We said, would it be OK for us to come and honour the native people of this place," he said. The voyage, he added, had been an "opportunity to celebrate native knowledge and look at ways that we are more common than we are different".